Jake at EconompicData.com put up this chart this morning. Like a lot of his work, it makes a point with little need for a lot of elaboration. We all know auto companies like a lot of other retail merchandise relied on financing to goose the growth of the last few years. What we probably don’t focus on enough is how untenable the financing that underpinned this growth had become. 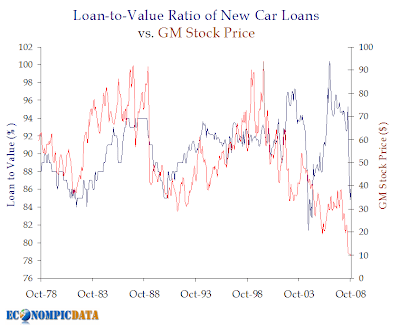 A close look at the chart shows that round about 2006 GMAC and probably lots of other lenders were loaning in excess of the value of the car that was being purchased. I’m sure you winced as I did as friends told you about being upside down in their new BMW and then assured you that it was all worth it for the ride. If you want to look for a larger point, it might be that even had we not had a financial sector meltdown, the auto industry was probably, like the housing industry, living on borrowed time. The fall was inevitable. The same can probably be said for most other retail sectors. Many of those were simply driven by home equity or insane credit card limits. So, assuming retail credit extension becomes more rational, a return to normalcy in the financial sector doesn’t by any means imply a return to prior retail sales levels.